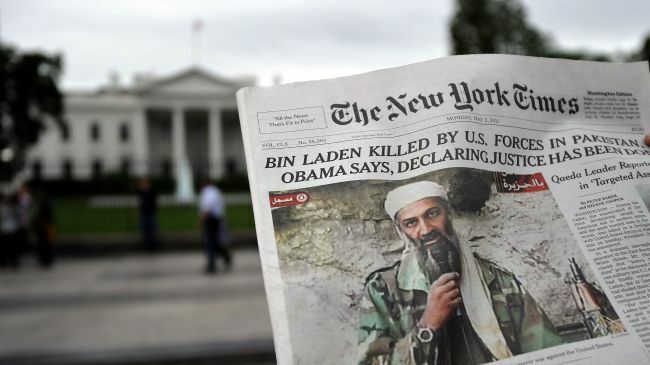 A man reads the front page of the New York Times featuring a picture of Osama bin Laden, in front of the White House in Washington, DC, on May 2, 2011. 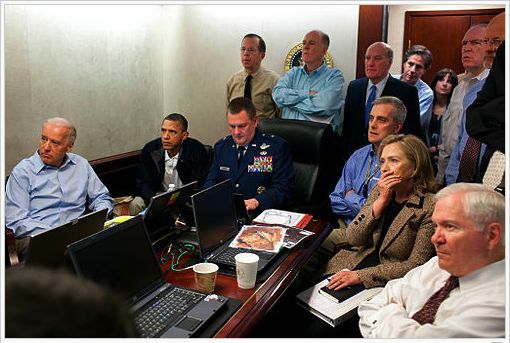 Osama bin Laden was not killed on 2 May 2011 during the raid on a compound in Pakistan. He actually died in Afghanistan on or about 15 December 2001 -- and he was buried there in an unmarked grave. A film that may even take the Academy Award for “Best Picture of 2012” raises serious moral issues; glorifies a political stunt and is based on an historical fiction. It is the latest in Obama propaganda. Local obituaries reported Osama’s death at the time. Even FOX News subsequently confirmed it. He was buried in an unmarked grave in accord with Muslim traditions. He did not die in Pakistan. Nick Kollerstrom has published about it, Osama bin Laden: 1957-2001. David Ray Griffin has a book about it, Osama bin Laden: Dead or Alive. And Scholars for 9/11 Truth has written about it. The film suggests that torture produces actionable intelligence, when virtually every military and intelligence expert will confirm that you are told what those being tortured think you want to hear to stop the pain. As TIME and the Huffington Post have reported, the film’s depiction of torture has created a controversy that may affect its chances for an Oscar. Among the most notable commentaries is one by Matt Tiabbi. Even more importantly, the political context has been all but lost to history. Obama was on the hot seat for an apparently fake birth certificate, having troops in Pakistan and not closing Guantanamo. By alleging that the tip had come from a prisoner held there and using troops stationed in Pakistan, in a brilliant political stroke, he took his birth certificate off the front page, positioning himself for re-election. Osama was “our man in Afghanistan.” During the uprising against its occupation by Soviet forces, he was instrumental in securing Stinger missiles, which were used to shoot down their helicopters and planes. In an earlier film about Afghanistan, “Charlie Wilson’s War”, Osama’s role was conveniently omitted. It would have been embarrassing to have acknowledged “the man behind 9/11” had been working for us. Nothing could be more useful than a shadowy “terrorist” threat that has no geographical boundaries, where you can commit a terrorist act any time it’s most politically convenient, as with the Bali bombing. Australia had been reticent about joining the “war on terror.” What could be a greater inducement than to slaughter many Australians by means of a fabricated attack to motivate its enthusiasm for that war? Analogously, what could have been more beneficial to Obama than to “take out” a man who was already dead by executing a political stunt that most Americans would not be in a suitable position to contest? But there were problems. Local residents had never seen Osama. They identified the man in the photo as the compound’s owner, who was not bin Laden. The SEALs performed their task and were gone. A photograph of the President, the Vice President, and the Secretary of State was widely circulated as engrossed in watching it go down in real time. But the photo itself would turn out to have been staged. Leon Panetta, Director of the CIA, let the cat out of the bag by noting that there had been no visual footage of the raid during its first 20-25 minutes, which was more than the lapsed time for the whole event. The body was allegedly identified by DNA comparisons in less time than scientifically possible -- and was then dumped into the sea “in accordance with Islamic practice,” which was a ridiculous contention. Burial at sea is disrespectful of the body, which can be consumed by sharks, fish and crustaceans. That is not a Muslim tradition, but it conveniently disposed of the most powerful proof of fakery and fraud. When most of the SEAL team involved in the raid were killed when their helicopter was shot down in Afghanistan a few months later, it was not implausible to suppose that they might have been silenced. Another prominent figure who has acknowledged the existence of a “government within the government” is William Jeffrson Clinton, who admitted that this is an entity over which he exercised no control. Research by experts at the Vancouver Hearings (15-17 June 2012) has vindicated his claim, where US neo-cons -- with assistance from the Mossad and the complicity of the Pentagon -- orchestrated 9/11. There are many articles about this, including “Peeling the 9/11 Onion: Layers of Plots within Plots” (with Preston James) and “James H. Fetzer: 9/11 IRAN REVIEW Interview”. Or read “9/11: Have we been bamboozed?” The second death of Osama does not stand alone. Dr. James H. Fetzer, a former Marine Corps officer, is McKnight Professor Emeritus at the University of Minnesota Duluth. A leading expert on the death of JFK and on the atrocities of 9/11, he has published extensively as a journalist for Veterans Today. He edited ASSASSINATION SCIENCE (1998), MURDER IN DEALEY PLAZA (2000), and THE GREAT ZAPRUDER FILM HOAX (2003) on the assassination and chaired or co-chaired four national conferences about it. The founder of Scholars for 9/11 Truth, he has published THE 9/11 CONSPIRACY (2007), organized the Madison Conference on "The Science and Politics of 9/11" and, during 2012, The Vancouer Hearings, which brought together experts on different aspects of the case. The conclusions to emerge include that no Boeing 757 hit the Pentagon, that all four of the crash sites were faked or fabricated in different ways, that mini or micro nukes were the most likely explanation for the "collapse" of the Twin Towers, and that Israel and American Neo-Cons planned 9/11 to promote their political agenda. The archives for his radio show, "The Real Deal", on revereradio.net, at radiofetzer.blogspot.com, include more than 500 interviews on the most complex and controversial issues of our time. His most recent and important articles are accessible via "Veterans Today, Jim Fetzer".